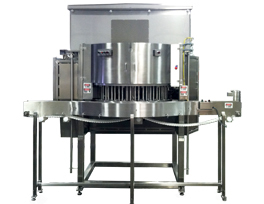 Midway Meat Stuffer and Netting System produces a netted poultry or beef package for easier handling, processing and cooking. Available in a wide range of capacities, these automated systems for food processing are designed with safety, speed and sanitation in mind. Every stuffer is constructed of 304 stainless steel and features simple controls with multiple switches for safe, efficient operation. Available in single or double shoot output to meet your specific requirements. Drains and troughs to channel liquids to floor.All electrical controls are housed in a Hoffman NEMA 4X waterproof enclosure, to provide protection from high-pressure wash down. Quick and easy tooling changeover for different product sizes. Our Stainless Steel Container Pumps are custom designed to fit your application. Using the latest technologies, the stainless steel plumbing offers safe and efficient pumping of food and pharmaceutical fluids or paste of various viscosities. Many times, the setback with pastes and high viscosity products is the pump cannot be primed so it basically cavitates and pumps air instead of the product. Our Stainless Steel Container Pump maintains a positive prime on the pump, making certain it does not cavitate. Easy to clean and offering quick change over, Midway Container Pumps can be built to accommodate standard and custom size. Epoxy painted gearbox and motor or stainless steel. Custom designed to fit your containers. Food: peanut butter, margarine, cooking fat, fruit paste, etc. Pharmaceutical: ointments, lanolin, aluminum hydroxide pastes, etc. Chemical & General Industrial: adhesives, paint, mastics, grease, inks, resins, tile adhesive, sealants, wax, wood filler, etc. Our in-line Flavor Dispensers provide even seasoning dispensing onto your conveyed product, at virtually any conveyor speed. 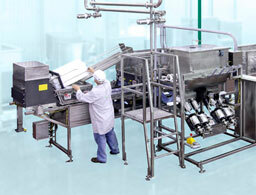 Spices and flavoring are metered through a special meshed belt for a uniform, lump free application . . . and a superior product. Stainless steel motors and gearboxes. Can be ordered with or without a lower product conveyor. Designed and built to any width required. Sight glass in hopper to monitor spice level. Uniform side to side application of seasoning. pass through the meat. The manual loading of the leg is easily accomplished by placing the leg into a loading hole. washdown. 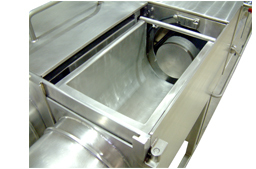 Stainless steel conveyors are available in many different styles, including fixed inline or portable – all engineered for use in food processing and handling. 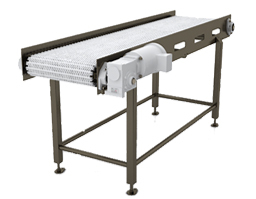 Incline, straight, and curved conveyors in a variety of widths and lengths are just a few of the configurations available. High quality conveyor belt brand names, Intralox, KVP Falcon, and Habasit. Long lasting, all stainless steel AC motors, Reliance, Baldor, Sterling, and Lincoln. Reliable, long lasting, stainless steel reducers, Winsmith, Baldor, Sterling, Grove and Dodge. Grease free, stainless steel and polymer bearings, Solidur, EDT, Valuguide, and Dodge. Heavy-duty frame construction consists of polished square stainless steel tubing and formed polished stainless steel sheet metal. All seams are fully welded and polished to eliminate hard to clean areas. 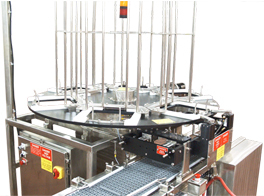 This Rotary Tray Magazine is specifically designed to reduce time loading food trays, by allowing the operator to load 6 stations at one time. Heavy-duty stainless steel frame and hard anodized aluminum turn table for long lasting corrosion resistant service. NEMA 4X Hoffman waterproof control cabinet. Smooth operating rotary indexer for consistent performance. Simple to operate controls with an Allen Bradley PLC for long lasting dependable service. Fits all half-size steam tables with no changeover or adjustment. Works with the Midway Machine Tray Denester. 6 station approx 1300 tray capacity. Electrical: 460 VAC 3 phase. platens eliminates the need for flights on the infeed or assembly conveyors. This allows for maximum versatility, while accommodating the usual fluctuations in the use of this Automatic Infeed Tray Lid Sealer. Allen Bradley Panelview control screen enables the operator to access all of the sealers functions to maximize performance. A simple tray platen changeover for different size trays provides the ability to use sealer in multiple tray assembly lines. All electrical controls are housed in a Hoffman NEMA 4X waterproof enclosure, to provide protection from high pressure washdown. Stainless steel casters for ease of movement, permitting the conveyor to be placed into different tray assembly lines. Many options are available to fit your requirements. Intralox, Allen-Bradley, Dodge and Banner are just a few examples of high quality American made components. Stainless steel and hard coat anodized aluminum construction, along with stainless steel bearings, provide maximum corrosion protection. Allen Bradley servomotors and controls for automatic infeed of trays, allows for randomly spaced trays. A continuous duty heat roller provides a superior seal with a wide variety of films. Two heat rollers are available for higher speeds. 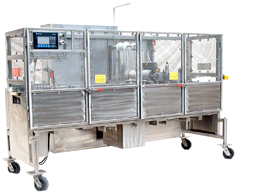 High infeed speeds are capable of running up to 100 trays per minute with random tray spacing. Electrical: 460 VAC 3 phase, 60 Hz, 30 Amps. Size: 44″ wide x 72″ high x 108″ minimum length, longer lengths are available. Tray sizes: width 3″-9″, height 1 1/4″ -3 1/2″, length 8″-14″. tray denester, platen conveyor, piston filler and lid sealer. 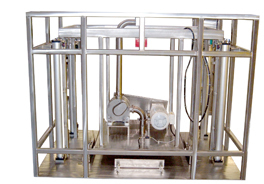 This inline filling system can be customized to meet your specific application. 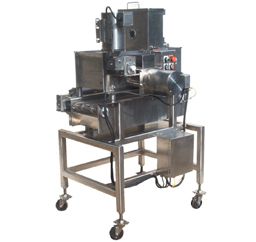 Originally designed for high-speed packaging of viscous products, the piston filler can be modified for various food products and production volumes and the platen conveyor, denester and lid sealer can be changed over for virtually any size frozen food entrée. designed to handle high volume production parts in a range of sizes. 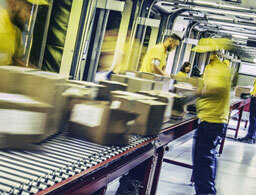 Robots can be floor mounted or overhead-mounted for optimum utilization of the work envelope and a smaller footprint. 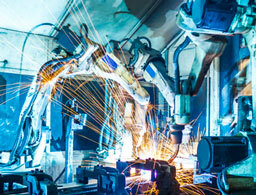 We can recommend specific robot technology based on the type of workflow or design to client preferences. Our tooling capabilities give us better control over fixture design and manufacturing, as well as end of arm tooling. 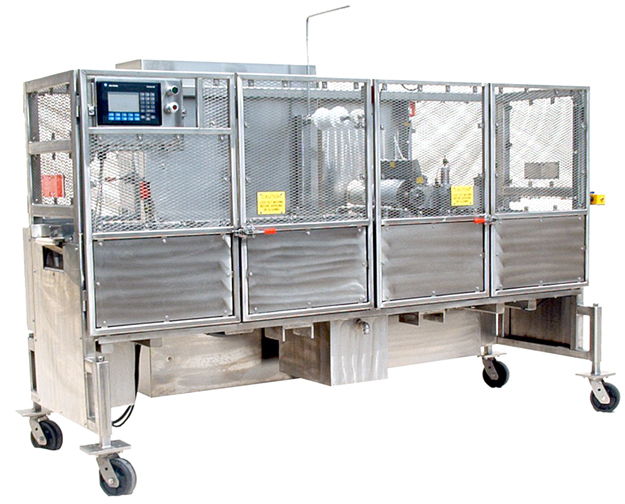 Optional air handling units help contain and exhaust fumes for improved work conditions. conveyor system to meet your current and future needs – all with accumulation areas, indexing, machine vision sensors and stop gates, and related features to sequence your product through various production stages. Our linear conveyor system experience will provide the process control, accuracy, and throughput required for any application. Many of our straight, curved and incline conveyors are available as portable units, adding greater flexibility to your production floor.